I think this is a pretty balanced list for 1500 that offers a lot of options. 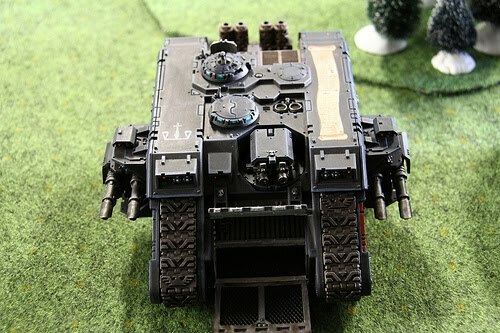 We have a quality death star unit that can control the middle of the table with the thunderhammer terminators embarked in the land raider crusader. Fire support options are plentiful: Double dakka predators for either light vehicles or horde infantry. Land speeders are outfitted with typhoon missile launchers to knock out vehicles from long range. The razorbacks have both lascannons and plasma guns to deal with heavy threats. I can combat squad one of the marine squads and then place three of them in the razorbacks. The fourth unit can camp an objective and fire a missile launcher from long range. Anyone hate this list? I'm a bit of a novice when it comes to marines. I just try to get units into my lists that can deal with real threats effectively and efficiently. I think this list accomplishes that. I hope to get a game with this list sometime in the near future. I'll report my results on this blog. 2 Response to "Army: Space Marines at 1500"
Looks like a tough list. I think you mean Autocannons on the Preds instead of assault cannons. Personally I would try to find the points for a second heavy bolter on each Land Speeder. Those things can deal out a lot of dakka when built that way. More than a dakka pred. Edited to clarify the typo. According to army builder I can pick a typhoon missile launcher or a second heavy bolter but not both.